If you’re lucky enough to do what you love. Count yourself as one of the luckiest people in the world. 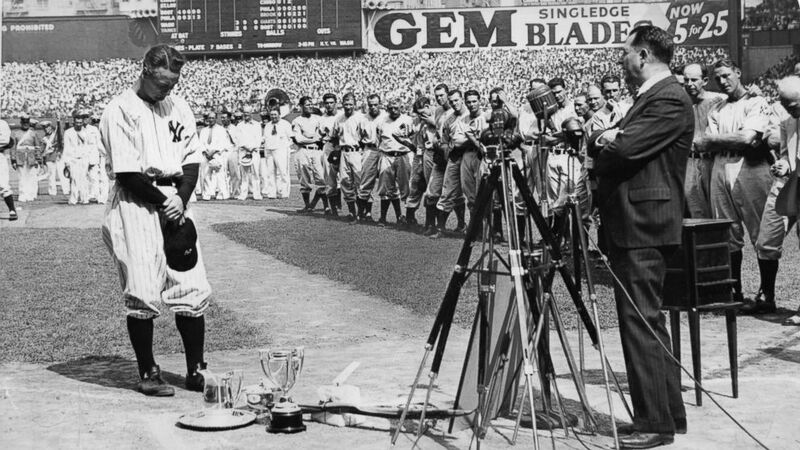 It was 75- years- ago on July 4, 1939, when a man stood in the face in of adversity and gave thanks. He called it a “bad break,” and most would have never been able to muster the words to show their gratitude for what life has blessed them. So today, instead of finding fault or directing blame. Give thanks for the wonderful things we sometimes take for granted. In front of 61,000 fans at Yankee Stadium, a man who the game respected grabbed our hearts and gave us immortal words to gauge our lives. This shy man stood in the sun and informed the world “that he had an awful lot to live for.” With yesterday in mind, I took stock of my life. The good, the bad, and everything in between. On Friday, July 4th I was working at Belterra Park. It was a perfect summer day and didn’t have the bite of brutal heat and humidity. You couldn’t have ordered up a better day. Well, that all depends who you are. On July 7, 1954, a baby boy was born into a hard-core horse racing family in Lepanto, Arkansas. He has rolled a few winners since his first mount in the spring of 1973 at Beulah Park. He cut his teeth racing against Hall of Famer Earlie Fires and Jackie Fires who was paralyzed in a horse race in 1977. His first winning mount was aboard Rablu that same meet, and over 46,455 mounts later according to Equibase. Perry Wayne Ouzts can look back on a career with great pride. Perry went past Hall of Fame rider Jerry Bailey to become the 17th winningest rider in history. When asked what it felt like to achieve such a feat he replied, “Just another day at the office.” Ouzts did take glee in replacing Jerry Bailey in the 17th position, “Now that does mean something special because he won most of his races on Cadillac’s I had to work for my wins.” The statistics certainly bear out the difference in the quality of horses ridden by each. In 30,856 mounts Bailey’s horses accrued $296,113,529, while Ouzts has ridden in 44,321 races for earnings of $35,209,787. “When he started out he could have been a leading rider in Chicago, New York or anyplace, he is just that good,” stated trainer Ken McPeek, who also started his career at River Downs. “Perry just liked to stay close to home. He’s one of the best.” Ouzts’ biggest career win came in the $200,000 Cradle Stakes at River Downs in 2007 on a horse he rode for McPeek. – This was according to Ray Paulick, of the Paulick Report. On July 4, 2014, 59-year-old Perry Ouzts won five out of five races from an eight race card. I spoke to him as he sipped on an soda with his wife Toni. You would have to pull teeth to get Perry to speak, as he lets his action on the track do his talking. If you were to have seen him on this day, you would have thought it was just another day at the track. Longtime River Downs publicist and Belterra Park consultant John Englehardt tabbed him the “working man’s hero.” Nothing could have summed his career better as he comes to work everyday and just gets it done. John told me of the day when he had a motorcycle wreck on the way to River Downs one morning. Many would have thought he would taken a couple of days off, but he rode that day and only won two races on the card. Englehardt has been on the scene for years chronicling his achievements, and every time his tape recorder was near Ouzts there were blips and blurbs for answers. I guess its rare to find a blue-collar rider who is mentioned name is mentioned with the greatest of all-time. A man who is grateful for what the game has provided, and humbly continues daily doing what he loves. In two days, he’ll turn 60-years-young. His wife Toni said “he wanted to keep it quiet about his birthday,” but I’m sure there are many fans like myself who are in tune with his career. Perry Wayne Ouzts has provided more fantastic finishes than any other rider I have watched in person. He didn’t travel the world to get it done, and stayed close to home to be with his wife Toni and two sons. I can’t relate his on-going career to the late-great Lou Gehrig, but they share the working man’s outlook, the never give-in attitude, and the feeling of gratitude for the many blessings they have received.